Start your seeds now. What you need to know! If you’ve been searching for some information on growing vegetables from seed Australia, then you’ve found it. 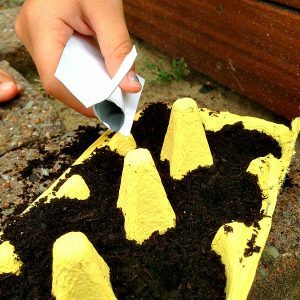 Growing your own food from seed is such a rewarding experience to share with the kids and it’s really simple to do. The hardest part is remembering to keep your eye on them. Because they are precious, like babies, they need to be looked after. Not only is it easy, but it’s fun and a very cost-effective way to shop for fruit and veg! The thing to remember with seed raising is it takes about 4-6 weeks for them to be ready for your garden. If you can protect them through the initial stages of life, they will be much stronger when they head out into the veggie patch. First off you need to select your seeds to sow. Check out our latest planting guide by joining ‘Family Garden Life – Our Food Garden Facebook group. Here you can also join the conversation about growing produce in your family garden. It’s a great place to ask for help and get guidance along the way. There is a wide selection of seeds on offer these days, so you can try just about anything, as long as you’re in the right season. Once you have selected your seeds the next step is selecting their new home. 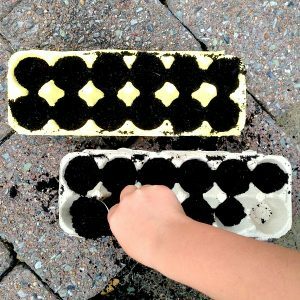 You can use lots of different options for seed raising. We like to use egg cartons since we have them already, but you can purchase biodegradable jiffy pots or round pellets as a different option. I’ve tried egg shells but they are a bit of hard. You have to take the lining from the inside of the shell out first and they are a little bit fiddly to fill. You can also use toilet roll holders with the bottom folded in to make a base, and use newspaper to make little cups by folding them like origami. They can all be planted in the garden with the seedlings which helps with the transplanting stage. 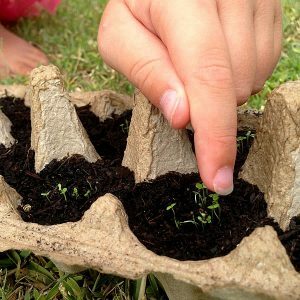 The other option is you can use existing seedling trays or recycled containers from your garden or kitchen. Choose a seed raising mix to start your seeds because they need lots of room to move during germination. Get the kids to help you through this stage, we just used a spoon to fill the sections. The trick here is to not push the soil down. If you give it a couple of light taps, that will suffice. There is a slightly different process to use with small seeds as opposed to bigger seeds. With the small seeds, you can just sprinkle them on top and give them a very light top layer of soil. You’ll find they don’t like being buried in deep. However, you can use a pencil to poke a hole in the soil and bury a larger seed deeper in the soil and cover it up. Just remember not to compact the soil. Look after your seeds, keep the soil wet, but don’t drown them as they don’t like being over watered. The best way to control your water is by using a spray bottle. The seed raising mix is designed to have great drainage which means you need to keep the soil wet. Pop them out in a protect spot where they can get lots of light, but make sure they aren’t in direct sun for too long and get overheated. Treat them as ‘fragile and handle with care’. 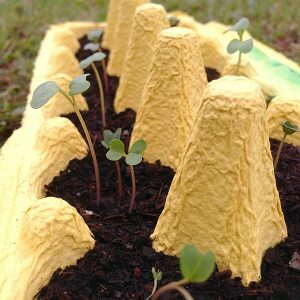 When you start to see your seedlings emerge they will start to form their seedling leaves. They are too little to do anything with at this stage except tend to their water and light needs. The germination stage can take a few days to a week or so. Be patient and remember not all seeds are the same. After a few weeks, you will notice the seedlings will start to form their true leaves. They are still not completely ready to go out into the garden yet. However, you can start to thin out and remove the weaker ones, and give the stronger seedling a bit more room. At this stage, you can start to expose them to the elements a bit more each day so they can get used to the real environment of your veggie patch. There are lots of things that can go wrong out in the garden, such as overheating, loss of moisture and getting eaten. You’ve got them this far, so please make sure they are strong enough to transition to big school. It’s always a tough decision knowing when to plant your seedling in your veggie garden because you’ve got them this far, and you want to make sure they survive. My best advice is that once they have their adult (true) leaves, and they are strong and healthy, they are ready to be replanted. This is usually around the six weeks mark. You can provide a little hot-house for your seedling during this 4-6 week process by using a greenhouse or some type of climate control such as the top half of a soft drink bottle or equivalent. What this will do is provide a warmer environment for your seedling to thrive in, and all you do is take the lid off and on as the climate control. This will, of course, depend on the weather conditions where you live and will vary across our big country. You can transfer your seedlings straight into the garden inside their biodegradable starters. Follow the directions on the pack and if you are using egg cartons like me, just make a hole in the bottom so the roots can stretch through as they grow. You can also just empty them out like normal onto your hand and gently place them in their new home. Now your seedlings are out in the real world, keep an eye on them. Make sure they are getting enough water and feed them regularly. Keep your eye out for pests, they love seedlings the most because of their tender young leaves. Make sure you use a clean seed raising container. If you’re using an egg carton, make sure it’s free of egg contents. If you are using another type of container wash it out with hot soapy water. Follow the directions on the packet and make sure you are planting at the right time of year for that particular variant. You need to keep the soil damp. Spray regularly, if the soil is dry the seeds will not germinate. If the soil is too wet, the seeds can rot. Once your plants have started developing seedling leaves, you can give them a regular feed every couple of weeks with a 1/2 strength liquid fertiliser. Be mindful not to spray on the leaves in the sun or it could burn them. Instead, spray at night-time in the soil, to begin with until they get used to it. Plant the matured seedling into the soil at the same height they are currently growing at. Don’t go burying them in too deep. If your seedlings have gone a little bit leggy, or spindly, just make sure they are planted slightly lower and propped up a bit with some soil. If your seedlings are growing really tall and spindly, this means that they are lacking sunlight. They are in fact, growing and reaching for the light. This is not an idea seedling as they will be too weak and get damaged easily by the weather. To avoid this, make sure your seedling get enough light and sun during the day to grow strong and healthy. A window sill will probably not get enough light unless it’s getting direct sun.